Samsung's camera division is on a mission: to convince shutterbugs everywhere that mirrorless cameras can be just as powerful and versatile as DSLRs. They made this point a few months ago when they invited New Yorkers to their Ditch the DSLR event and trade it in for a Samsung NX30. Now they're pressing the issue with the new Samsung NX1, a new 28MP flagship camera with fast auto focus and 4K video recording capability. Though this camera is being pitched as a tool that can satisfy the needs of professional photographers, there are features that make it attractive to people who want great shots in their everyday lives to share with their friends and family. The NX1 is a camera that can capture everything from baby's first smile to the exact moment your Little Leaguer hits her first home run. Samsung is duly proud of the NX1's speedy auto-focus system which makes it possible to to take perfectly in-focus shots continuously, even if you or your subject moves around. A phase detection system inside tracks moving subjects and even predicts motion, so the camera can put the focus exactly where it needs to be the moment you press the shutter button. Using this technology Samsung developed an Auto Shot feature that can automatically capture the moment when a baseball player's bat connects with a pitch. While this might seem like a pretty limited function, Samsung is still developing other scenarios where the tech will be useful. The fast auto focus and tracking is available in video mode as well. Want video of a soccer game or just the kids running around and playing? With the NX1 the footage won't just be a blur of motion. And you'll be able to watch it on your Ultra HD or 4K resolution TV with all available pixels intact. The NX1 can record video at both resolutions and can both record and stream to an external source at UHD resolution. 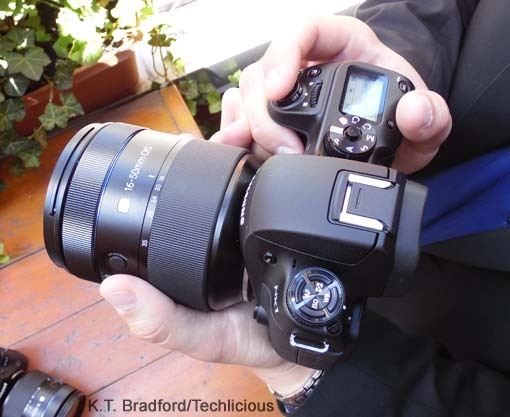 The NX1's design is more compact than a DSLR but still substantial. It feels solid in the hand with a comfortable, stable grip that gives you a firm hold, even if you attach a heavy lens. The magnesium body is dust and water resistant; when combined with a similarly robust lens you have a camera that can deal with a little rain or a day at the beach without danger of damage. The LCD in back is bright and colorful enough to see in direct sunlight and tilts up to 90 degrees for framing shots at difficult angles. There's also an electronic viewfinder that has a seriously short delay--milliseconds--which means no discernible lag between what you see there and what's actually happening in front of you. In addition to the usual dials and buttons you'd expect on a high-end camera, the NX1 also has a small LCD on the top showing key settings and battery life, easily read at a glance. 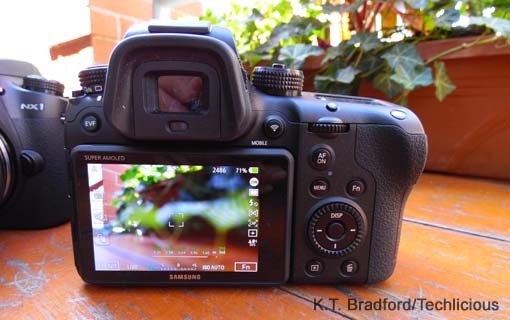 This is a Samsung SMART Camera, so it has Wi-Fi connectivity (b/g/n/ac), NFC, and Bluetooth 3.0. 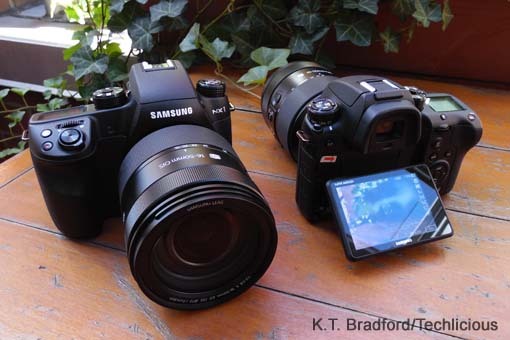 The Bluetooth is for faster pairing with smartphones and tablets for transferring pictures or turning them into remote viewfinders via Samsung's app. With Wi-Fi connectivity you can backup directly to the cloud or even stream pictures or video to a wireless TV set. The NX1 is coming in mid-October and will cost $1499 for just the body. As I said, this is primarily aimed at serious photographers, folks who tend to have compatible lenses already. However, you can buy the Pro Bundle, which includes a very nice 16-50 mm lens, a battery grip (for easy portrait orientation shots), an extra battery and a charger for $2799. If you've already invested in a Samsung NX series camera but want to up your game and take great pictures in any situation, the NX1 is definitely worth a look. It's a high-end camera in a relatively compact body that is so easy to use and hold. It will inspire you to learn how to take better pictures and explore the world outside of the Auto setting.